1. I spotted this gorgeous fall flower arrangement while out to dinner with my parents last week and had to take some photos. 2. I first started drinking hard cider when I lived in England and every once in awhile will pick some up. It's so fall-y ad the perfect alternative when beer, wine and liquor just don't sound appealing. 3. I picked up a few miniature pumpkins to perk up our coffee table. And the winner of our Red Tile Studio giveaway is ... Elizabeth! You did a great job! Ahhh I love cider! 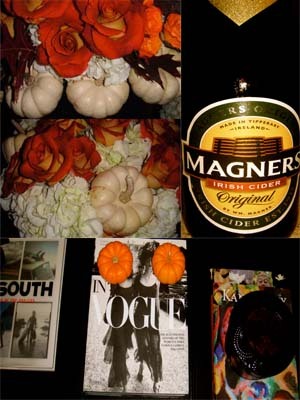 I love hard cider in the fall-it's just divine!